In 1940 Rotterdam was bombarded. A large part of the city center was destroyed and had to be rebuild. This reconstruction has made Rotterdam as we know it today: a modern metropolis with a lot of unique architecture. Unfortunately, the bombing of Rotterdam has also destroyed a lot of its history. But there is still a lot of pieces of the past to be found in the port city, especially in the Old West. With this Historic Route in Rotterdam we bring you to those interesting places. How to get around? For this route we recommend public transport or going by bike, as some parts are quite far away from each other. Tip: Walk along the fire line in Rotterdam. The fire line shows what area was destroyed in 1940. Since 2010 this border is marked with icons that show flames with the silhouettes of the burning city, a Heinkel He-111 bomber and the image of La Ville Détruite (the Destroyed City) of Ossip. Delfshaven is located next to Rotterdam West and Middelland and is easy to reach with the subway or tram. Historic Delfshaven has more than 700 years of history as this piece of Rotterdam survived the bombing in 1940. This allows us to admire the architecture from back in the day. 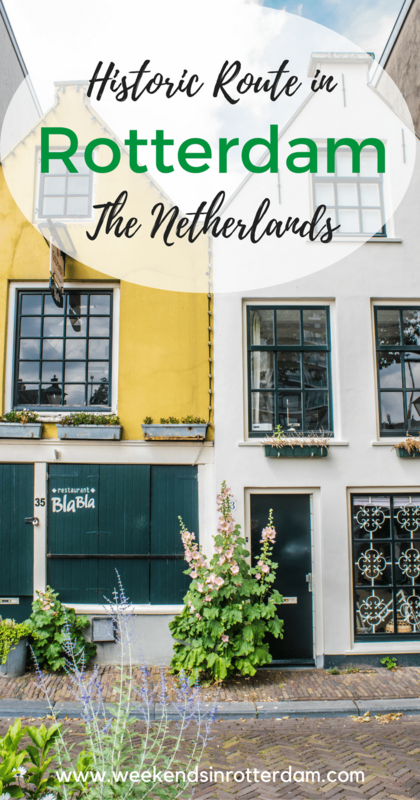 Delfshaven is in contrast with the modern city center of Rotterdam, with cute little narrow streets and tall but narrow town houses. 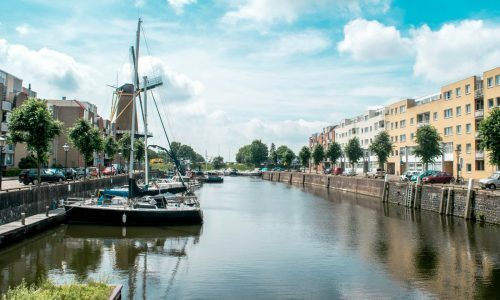 So if you are looking for a piece of Rotterdam history, we recommend starting at Delfshaven. The 1st Middellandstraat and the Vierambachtstraat have a lot of great restaurants with exotic kitchens. A good place for having your breakfast too! The Binnenweg is situated between the city center of Rotterdam and Delfshaven. From the 1st Middellandstraat you can reach the Nieuwe Binnenweg within 10 minutes. This is also a part of Rotterdam that survived the bombing. Already in 1454 there was a “Binnenweg”, what was called the Coolpolder back then, and it runs from the old center of Rotterdam through the meadows to the village Delfshaven. At the New Binnenweg and Old Binnenweg you will find nice vintage clothing stores, culinary items and stylish boutiques. We recommend to start at the Nieuwe Binnenweg and then head to the Oude Binnenweg. They are basically the same street with a road between them, thus easily combined. Food & drinks: ‘T Ouwe Bruggetje, Poolcafé Delfshaven, Stadsbrouwerij De Pelgrim, T Pakhuys, Bij Loes, Café de Ooievaar, Het Wapen Van Delfshaven, Het Eethuisje van Delfshaven, De Olijventuin Van ‘t Zuiden. Food & drinks: Koekela, Waldberg, Kraftbar, Grillig, Vlaamsch Broodhuys, The Burgerhouse, Spaghettata, Viva Africa, Ciao Pirandello, Jordy’s Bakery, Café Stalles, Green Delight. It’s possible to get from the Oude Binnenweg to Kruiskade in a few minutes time. This is another piece of history in Rotterdam. The Kruiskade already existed in the Middle Ages. Back then it was a low embarkment between the Coolpolder and Schoonderloo on the one hand and West Blommerdijk and Beukelsdijk on the other. In the 19th century a large part of the Kruiskade was built. The West Kruiskade was in Delfshaven and became the heart of the Old West. The two Kruiskades are not far from each other and can certainly be combined. 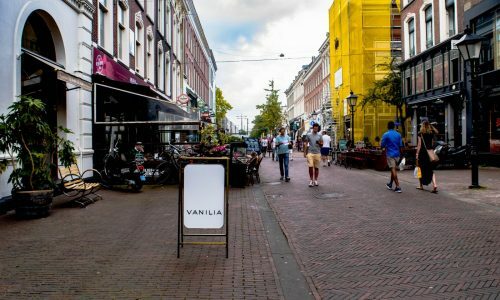 At the West-Kruiskade you will find a mix of cultures and it’s definitely a great place to have lunch if you love some exotic dishes. 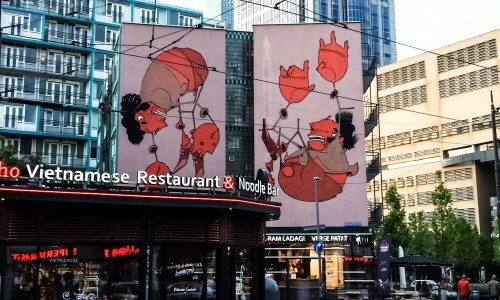 For instance, take a nice bowl of Japanese ramen at Takumi Düsseldorf on the West Kruiskade. To go to the Old Port we recommend to take the bicycle or the tram at Kruisplein and get off at Station Blaak. The Old Port was formed around 1350 when a dam was laid in the Rotte and is Rotterdam’s oldest and first port. Fishermen started living at the dam where they build a wharf, and over time Rotterdam emerged. At the Old Port you will find, among other things, the White House which was once the tallest office building in Europe with its 45 meters. The building dates from 1898. Plan C, from 1880, was a business collection building that was part of a city planning operation. The Cube Houses were build in 1984 and thus significantly newer, but certainly worth the visit. At the Old Port you can find many nice and cozy restaurants and bars. It’s a great place to end your day and have a bite to eat! Food & drinks: Soi3, Orient Parel, Takumi Düsseldorf, Johnny’s Burger Co, Mimoza Shoarma, ILYA Rotterdam. Food & drinks: Apartt, Restaurant Mooii, Popecatepetl, Kade 4, Stockholm, Dutch Maritime Pub, Restaurant Fitzgerald, Meat, Noah Rotterdam, Restaurant Van Leeuwen, Grandcafe Het Witte Huis, Plan C.
Hopefully this route will ensure a day full of Rotterdam history. Of course, you can also start halfway through the route, walk him from back to front, or cut it up in parts. And if you can not find a street, feel free to ask people around you. A real Rotterdammer knows exactly where it is! For your ease we have also included a map below.